The Reptoid God is caught "Red Handed". The diet of Central American tribes consisted of Maize, Kidney and Lima Beans, chili, tomatoes, sweet potatoes, pineapples, strawberries, peanuts, avocado pears, cassava, squash, pumpkin, gourds, persimmons, and cacao. This diet provided adequate vitamins and minerals. 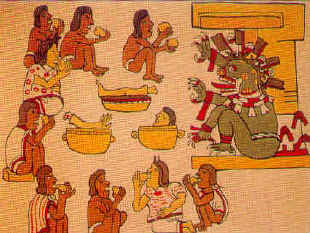 The Indian Artist painted this picture during the reign of the Reptoids, making clear that the humans all dined on yellow peppers, while the Reptoid ate human body parts. The Reptoid is seen with blood on the claws of both hands and right foot. The humans have no blood on their hands and are only eating vegetables that cannot be mistaken for human body parts. Most religions were started by the Reptoids for purposes of control and selection. In the Bible the "serpent" walked on 2 legs and gave man (represented by Adam and Eve) "knowledge." Why would God let a Reptoid "lead us astray" when they were the only 2 very important humans to watch over in the Garden of Eden?? The message here seems to be that God did not stop the Reptoids from doing with us as they wish. Since God won’t stop what the Reptoids do to us, HE won’t stop us from what we must do. Recently the aliens have been promoting prayer and calling on Jesus for protection from alien intervention. This is an alien developed scam and just a means of sidetracking humanity from needed defensive action. The aliens themselves went to a lot of trouble to create the impression that prayer is effective. Praying hasn't helped deter them in the past and suddenly it works? Previously the aliens used prayer to identify and eliminate human telepaths from the gene pool. With this "pray on demand" setup, they are trying to condition us to pray when we see them so telepaths can be quickly identified and removed.